If you want to pursue a career within the IT sector and need to start at the beginning, this course is for you. The 1 year, Level 1 Computing and Information Technology course has been designed to offer you an introduction into games; web design; multi-media; and networking. Creating a digital animated graphic. As part of this course, you will study English, Maths, Employability and Study Skills. In addition, you will develop employability skills through contact with leading creative technology professionals, providing you with powerful knowledge and skills required to succeed in further education and employment within the digital sector. Embedded in your study programme will be English, Maths, Employability and Study Skills. 3 GCSEs at Grade E/2 in English Language, Maths and IT or completion of an Entry Level course. During the study programme you will be set assignments that will be assessed and an overall grade for the qualification awarded. Successful learners will be awarded the Level 1 Introductory Diploma in Information Technology. If you achieve a Merit or Distinction, and a recommendation from the Course Tutor, you will be able to progress onto Level 2 Information and Creative Technology (including Games Development). IT project managers oversee the planning, development and installation of computer systems to meet their clients’ business needs. They work for all types of organisations from the NHS to government departments. If you're well organised, good at solving problems and have excellent IT skills, you may find opportunities for a rewarding career in this field. If you are interested in computers and like solving problems, this could be the perfect job for you. IT support technicians help to find and correct software and hardware problems for computer users. To become an IT support technician, you will need to have a wide knowledge of operating systems. You’ll also need to know about networking, hardware and software. And you’ll be able to explain problems and solutions clearly to non-technical users. If you have a good working knowledge of computer systems, you could begin as a trainee technician. You may improve your career prospects by gaining IT qualifications. IT trainers design and deliver computer courses. They work in the training departments of large organisations, and for IT training companies, colleges and universities. If you’re interested in IT and like the idea of showing people how to get the most from computers, this could be just the job you’re looking for. To become an IT trainer, you’ll need knowledge of IT programs and systems. You’ll also need excellent spoken and written communication skills, and the ability to adapt to your learners’ abilities. You can become an IT trainer in several ways. You’re likely to need qualifications in both IT and training/teaching. If you love computer games and enjoy using your imagination, this could be ideal for you. Computer games developers produce games for PCs and games consoles. They also produce games for the internet and mobile phones. The work could involve making new games or updating existing titles. Most computer games developers have a qualification. However employers may be more interested in your software skills and experience. To become a computer games developer, you will need to have creativity and imagination. You’ll also need to be able to work under pressure and to deadlines. If you are keen on IT and enjoy fixing things, this job could be ideal for you. You do not need formal qualifications if you have a good enough working knowledge of computer systems and software. A computer service and repair technician will have good communication skills. They will also have good customer service skills. You’ll also need to be patient and have an organised approach. Forensic computer analysts investigate computer-based crime (cyber crime). If you have an enquiring mind, can interpret data and want a career in IT, this specialist role could be ideal for you. To do this job you should have good problem solving skills, be able to pay close attention to detail and be able to spot trends in large amounts of information. To work in this job you will usually need some background experience in IT. Software developers design, build and test computer systems that help organisations and equipment to work more effectively. Examples of work include information databases, programs that control robotic systems, and cloud and mobile applications. If you are keen on computing, can pay close attention to detail and enjoy solving problems, this could be an ideal job for you. For this career, you'll usually need an HND, foundation degree or degree in computing or a related subject. Some companies will put you through a graduate training scheme even if you don't have an IT-related degree. Either way, you will need to be self-motivated and a quick learner.? 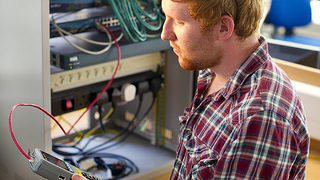 Network engineers, also known as network administrators, install and maintain the computer systems used by companies and organisations. If you're interested in computers, good at solving problems and like to keep up to date with developments in technology, this could be a great career for you. In this job you'll need strong IT skills. You'll also need good communication skills, with the ability to explain complex technical things in a clear way. You can get into this work through a computing apprenticeship, or by taking a course at college or university. You might also get into this career if you already have experience of working in computer maintenance. Web developers design, build and maintain websites and web applications to meet their client's needs. Jobs can range from creating a staff intranet for an organisation to building a payment system for an online retailer. If you want a varied job, can find creative ways to solve problems and have good programming skills, this could be the career for you. You'll also need to be a good teamworker, with the ability to meet deadlines. As a web editor you would research, write and check the images, text and other media published on your employer's website. If you are a skilled writer and researcher, with a keen eye for detail, this job could be ideal for you. You will need an excellent standard of spelling, punctuation and grammar. You will also need an organised approach and creative ideas to come up with interesting ways to present information and appeal to the site's target audience. There are various routes into this job. For example a background in journalism or marketing could help. Employers will want to see examples of your writing from previous paid or voluntary work. Many web editors start out as an assistant at first. You will study in St Pauls Computing Centre where there is twelve dedicated computing rooms, and a gaming room, each equipped with eighteen PCs running Windows 7, Office 2010 and a range of software including Dreamweaver, Illustrator, Flash, Fireworks, Photoshop, Visual C++ 2010 and a wide range of specialised software. We have Microsoft and CISCO Academy accreditation and industry trained tutors. You will also benefit from free wireless access throughout the building and a library and resource centre providing in excess of 60 computers and 45,000 books. Our computing and IT courses teach the skills and knowledge that will prepare you for University or a career in an IT or computing role. We can develop your knowledge of digital technologies and whether you want to be a computer games developer, IT manager or technician, these courses could be for you. Our students take part in a variety of trips including The Photographic Museum to see the professional uses of computer animation techniques and video production. If you are studying or progress on to a level 3 course you can apply to join the IT Career Academy. You will be able to carry out a 6 week paid internship with a local employer and have an industry mentor for the duration of your course. Taking part in this academy will also gain you extra UCAS points. In 2015 two Blackburn College IT/Computing students competed in the regional IT World Skills Competition and won their place in the national finals in Birmingham.